Cine Yara was built between 1945 and 1947, it opened on 23rd December 1947 as the Teatro Warner Radiocentro with 1,650 seats, and was operated by Warner Bros. It is located in the Vedado district of Havana on Calle L at Esquina 23. It is a pioneering building of the ‘Modern Movement’ in Cuba and was designed by architects Emilio de Junco III, Miguel Gaston and Manuel Domiguez. The cinema is part of a complex which includes an office block that contains its stage fly-tower. The main auditorium is used for film, with three 30-seat capacity rooms for video projection, located upstairs. It is considered the ‘main’ cinema in Havana and hosts many film festivals and gala screenings. 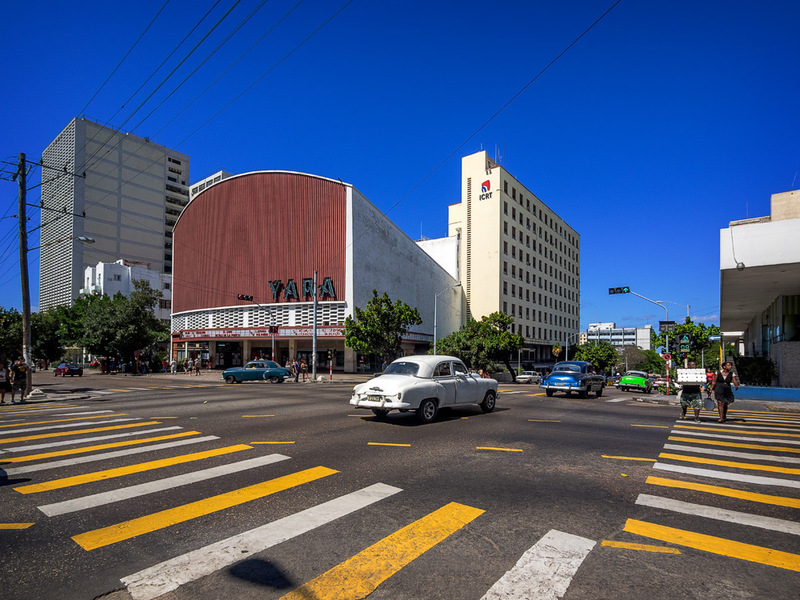 In 2015 it became one of the first cinemas in Cuba to be equipped with digital projection. It retained a 35mm projector to allow screening classic films.